Well some days back I ordered some makeup items online from Flipkart and as they were providing some attractive discounts I ordered this NYX Eye pencil from them. This is the first NYX product owned by me. Well these pencils are Eye/Eyebrow pencils and are not retractable which means you need to sharpen them .Which means product wastage for me. The consistency is smooth and does not tug, though I feel that there is a lot of waste due to sharpening and the tip breaks most of the times while sharpening so I’ve already wasted a lot of the product. On eyes with a primer it stays for around 4 hours easily and without it you can expect it to stay around three hours maximum. But I suggest do not use it above your crease as it will travel. 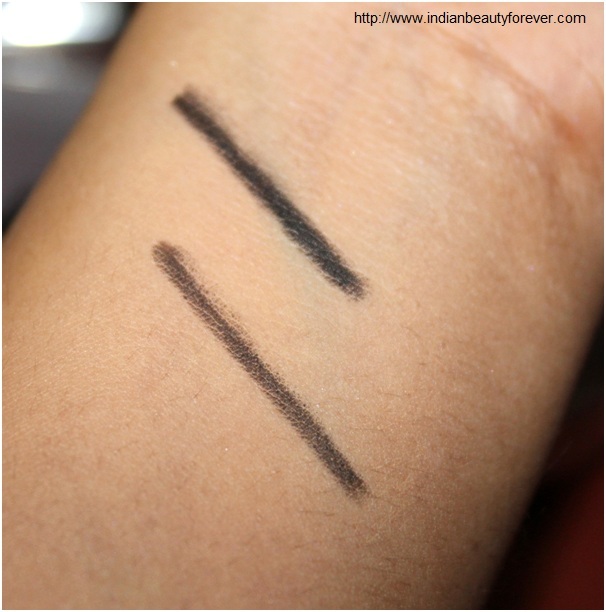 I have tried it on my waterline but did not like the results. It smudged like those old kajals we used to wear when we were young and was a horrible experience. Rating: 3 out of 5 as it smudges a lot and travels. Also the tip breaks easily. My Take: I am looking for better liners at this price as I feel there are many liners which have better staying power and consistency at this price. Great review, I love the Loreal slim liner. Everyone is Here to support a sweet person like you!! Niesha, I think it would be a good pick for the winter season maybe-no? Nai yaar, its not that good. Colossal has become a hot favorite, but i have not tried it yet. Nice review! : ) I haven't used NYX products yet, can't wait to do it!